Nestled amidst the Ocklawaha River Basin in Tavares, Florida. This secluded 400-acre island lies on Florida's largest chain of natural lakes, making it a paradise for golfers, boaters and nature lovers. 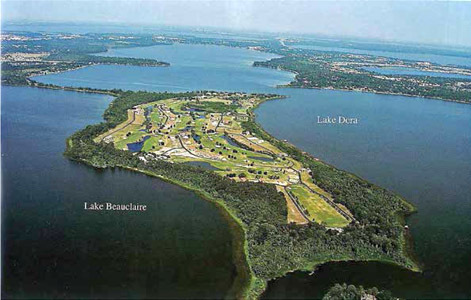 The Island is tucked between Lake Dora and Lake Beauclaire in the Mount Dora Chain of Lakes. Your journey to the Island offers you the opportunity to enjoy the picturesque landscape of the area's citrus groves and horse farms as Pontoon boats, Sailboats and Seaplanes decorate the lake. As you pass through the gates of Deer Island, life begins to slow down, you enjoy the breathtaking views of Lake Dora and Lake Beauclaire while sunlight peeks through the overhanging cypress and oak trees. Time seems to stand still as you begin to relax and enjoy all the sights and sounds the Island has to offer. The Island is convenient to Mount Dora, Tavares and Eustis offering a mix of antique and bric-a-brac stores, a steam train, festivals, regattas and bike races as well as restaurants and historic destinations. We are truly small-town America at its very best. Our homeowners really enjoy the Island lifestyle and its focus in every direction, water and golf. We are the only exclusive Island Golf Community in Central Florida. Though, some of our home owners enjoy the wide-open spaces and small town southern living, our bigger cities are not far from reach with Orlando, Winter Park and the Villages only 45 minutes away and New Smyrna Beach and the St. John River within 75 minutes. COPYRIGHT ©2019 PARADISE HOMES ON DEER ISLAND, INC. | ALL WORLDWIDE RIGHTS RESERVED. | WEB SITE DESIGNED AND MAINTAINED BY GFAD DESIGN.